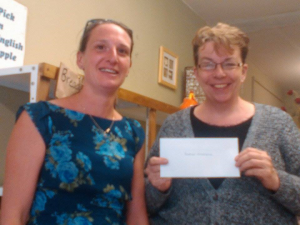 Sally Carmac Bailey accepts a cheque from Radstock and Westfield Big Local, on behalf of Radical youth club. The grant will ensure the youth club can carry on for another 6 months whilst they look for a sustainable source of income. The money comes out the Radstock and Westfield Big Local pot for ‘sustaining professional youth work in the area’. Radical provide a free weekly youth club run by a professional youth worker. Anyone under the age of 19 can attend. It's held in The Church Tea Rooms, behind the basketball court, Kilmersdon Road, Radstock every Friday from 7pm until 9pm. This entry was posted in Big Local Plan, People. Bookmark the permalink.